Date and Time: 25th, 26th & 27th May 2018 (Friday, Saturday & Sunday) from 8.30 a.m. to 6 p.m. Please note: Players with SAI rating between 1000 to 1150 can opt to play in the Premier division. If the number of players is odd in the premier division then the highest rated player in the open division would fill in the last slot of the premier division. The entry fee includes lunch, tea & snacks for all the 3 days of the tournament. Registration must be done in advance ( Last Date: 10th May 2018). Late entries will be charged Rs 500 extra. Exciting cash prizes would be given to the winners of both divisions. The 15th Goa Open Scrabble Championships 2018 will be held at the Padre Conceicao College of Engineering, Verna, Goa on 20th - 22nd April. This report was generated by tsh version 3.340. For more information about tsh, please contact John Chew. The above mention rate in exclusive of applicable government GST taxes (18%). Buffet Breakfast at the “Mega Bite” served daily between 07:00 am to 10:00 am only. · Use of the fitness center and swimming pool. A/C Rs.1700 (single) and Rs.2000 (double),tariffs include breakfast, - taxes extra. Final results are out from the WESPAC (erstwhile World Scrabble Cup) in Kenya, and the new World Champion is none other than our own Akshay Bhandarkar! A hearty congratulations to the WESPA Champion Akshay Bhandarkar! May not have been playing on team India this time but he has done India proud! Really amazing performance, keeping his concentration on till the very end. Team India - great performances by all 3 Sherwin, Ranga and Goutham. Far exceeded expectations I think with all 3 finishing in the top 20, Sherwin finishing at number 10! Proud to say that all 3 comfortably earned the bonus prize of Rs.10,000 put up by SAI for finishing in the top 50. Ranga started an amazing 1st 2 days, keeping at the top 2 spots at end of day 2 and had the full India scrabble community drawn to following the championships! Had a really bad 3rd day but I think he fought back well to finish at 16th place. Goutham also a very steady run to finish 20th. Sherwin again finishing strong to end at 10th position. Congratulations all of you! Akshay, it was really amazing to see you take the Championship - we always knew you had the potential but it takes a lot of preparation and concentration to actually pull it off - too good!!! Wordaholix is proud to announce the 4th edition of the Wordaholix Scrabble League on October 13, 14 &15, 2017. Venue : The International by Tunga, Andheri East, Mumbai. Looking forward to having our WSL family back with new participants as well! Pune Scrabble Championship 2017: Congratulations Nakul, detailed results below. 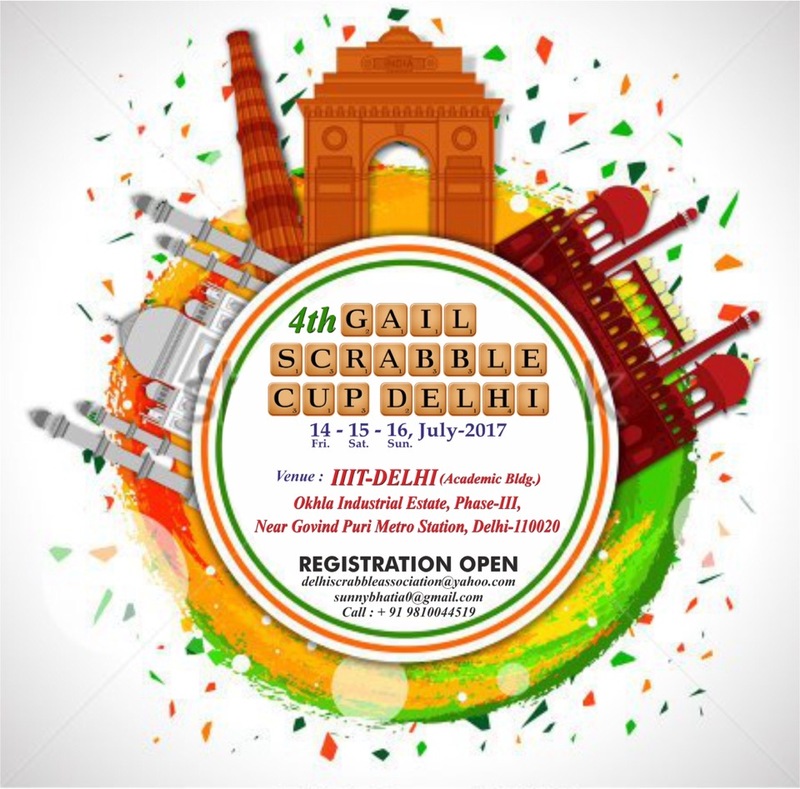 The Scrabble Association of Delhi proudly presents the 4th Gail Scrabble Cup,Delhi to be held on 14-16 July, 2017. Top 3 prizes increased further from last year. - To encourage under-18 players, there will be trophies and prizes for the top 3 under 18 finishers. In addition, to encourage new local talent, the top 3 under 18 finishers from Delhi will get trophies and their entry fees will be fully refunded. Entry fees will also be fully refunded for any other under 18 players that finish in the top half of the field and haven't received any other prizes. All Under 18 participants will get certificates from the Scrabble Association of India. A total of 24 games proposed .Day 1 9:00-9:45 a.m. Registration.First game to commence at 10 am sharp . Playing hours 10 to 6 on Day 1 (8 games, lagged), 9 to 6 on Day 2 (9 games, lagged), 9 to 5 on Day 3 (7 games, KOTH). Entry fees stay the same as last year: Rs 2,100 for SAI members and under 18s; Rs 2400 for all others. (or $35/$40 if you prefer to pay in USD). This covers breakfast, lunch, and tea/coffee/small snacks on all three days. Our city has a well-deserved reputation for food and hospitality, and we shall try to live up to that! Nehru Place, GK and Friends colony have ample of Airbnb options also. The exact number of games would be declared at the tournament venueWord source: Collins Scrabble Words (CSW) 2015Entry Fee: Rs 2300 for SAI Members and Rs 2500 for Non-SAI MembersThe entry fee includes lunch, tea & snacks for all the 3 days of the tournament. Registration must be done in advance ( Last Date: 10th May 2017). Late entries will be charged Rs 500 extra. Location: The A/c Conference room, Padre Conceisao College of Engineering, Verna, Goa. The Scrabble Association of Goa is organising the 14th edition of the Scrabble Tournament 29th April - 1st May 2017, a 3 day scrabble extravaganza. The A/c Conference room, Padre Conceisao College of Engineering, Verna, Goa. Please register in advance. Registrations to be sent to rajivantao@yahoo.com. If you are not a SAI member please make sure you mention your contact details (mobile and email) when registering. Registration fee: SAI members INR 2200, non-members INR 2400. Registration fees includes lunch and snacks on all 3 days. The tournament will follow WESPA rules and will be WESPA rated. 24 games, 16 AUstralian draw and 8 KOTH. Leonoras is a budget hotel (about Rs.1200 per AC room) right next to the venue - numbers are 0832-2791263/ 2791289. Woodbourne is a better hotel, about 15min walk from the venue (0832 2791003). But if you prefer beachside, any hotel around Colva will be 20min taxi to the venue.